Depart Nairobi in the morning for Aberdares National park in the dense forest of the Rift Valley arriving in time for lunch at the Outspan golf & Country club. Afternoon tranfser by lodge vehicle to treetops lodge for floodlit game viewing.Dinner and overnight at Treetops Lodge. After breakfast proceed to Samburu National Reserve cross Equator, travel through changing landscapes to the rugged-semi region, though harsh but having unique species like the unusual reticulated giraffe, grevy's Zebra, Beisa, oryx, gerenuk. These species are rarely found elsewhere. The bird life is especially notable. Arrive in time for lunch. Afternoon game drive is taken. Dinner and overnight at a lodge. Full day with morning and afternoon game drive. Optional visit to Samburu villages. Meals and overnight at a lodge. Depart Samburu after breakfast and proceed south to lake Nakuru, which is often referred to as the pink lake for it’s great masses of pink flamingos. Arrive in time for lunch. Can also see water buck, leopards impala, Buffalo and is currently a rhino sanctuary. Afternoon game drive is taken. Dinner and overnight at a lodge. Leave Nakuru after breakfast and head for Maasai Mara National Reserve which is famous for it’s great herds of wild game. 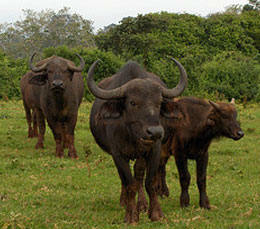 All animals found in Kenya among the “big five” are found here. Arrive in time for lunch. Afternoon game drives. Dinner and overnight at a loge. Full day with morning and afternoon game drive. Leisure at lodge or visit the Maasai villages- at a small fee paid separately. Meals and overnight at a lodge. Depart Mara after breakfast and proceed to Amboseli via Nairobi for lunch. Arrive to the park at the foot of the snow capped Mt. Kilimanjaro, Africa’s highest peak. Afternoon game drive is taken. Dinner and overnight at a lodge. Full day with two game drive. Meals and overnight at a lodge. Depart for Nairobi after breakfast, arriving late afternoon.